Freshers’ Week is a perfect introduction to life on campus at your new university. It is during this week that you are likely to meet the friends that will stick by you during the next three (or more) years, as well as your new flatmates for first year – and possibly beyond. Here, we list all of your Freshers’ Week Glow essentials, because we all know just how wild things can get. If you’re big on the party scene then you have some serious preparation to do if you want to be ready for the parties that Freshers’ Week has to offer. From late night raves to never ending pre-drinks, you’re going to experience it all. This week is all about settling in and starting your time at university with a bang – and that bang is sure to include at least one UV party. In order to survive this week and the hard partying that comes with it, you are going to need at least one pair of sunglasses (for the inevitable hangover – here at Glowtopia we’re a fan of the classic Wayfarer Sunglasses), paracetamol and caffeine to get you through the next day. Oh, and lots of glow for the nights out! Club nights and raves are all about the experience, and glowing objects can help make it a night you will never forget. From the classic to the quirky, we have everything you could possibly need, and you can find it all here at Glowtopia. Our 6″ 15mm Premium Glow Sticks, these are the number one glow item you are likely to find anywhere, and they look fantastic. You can get them in a range of colours and in multipacks to share with your friends. Light up the club when your favourite tunes come on, or use them to paint the town neon when you go out for drinks before or after. UV paint is an absolute must for any student that is celebrating Freshers’ Week. Get in touch with your creative side, and turn your face into a masterpiece. Once you hit the UV party, your face (and even body if you’ve painted that) will glow intensely – making you the centre of attention. Go wild and turn yourself into something spectacular. What better way to liven up the party with glow hats and glow glasses? Ideal for a night spent raving at your local (or campus) club, as well as those spent in your flat drinking and having a good time with new friends, these nifty accessories are a perfect little extra! Almost every single University Freshers’ Week will involve a white t-shirt party, and what better way to stand out at these events than with UV fabric paint? Simply apply to a white t-shirt and once under UV light it will light up producing amazing effects! Freshers’ Week is going to be amazing, and you are going to have the time of your life. 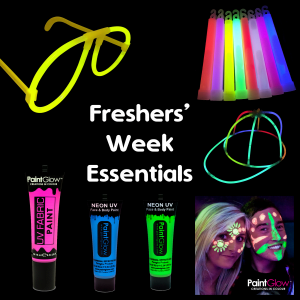 Check out our Freshers’ Glow Pack for our favourite Freshers’ Glow Essentials. Whether you are partying from the comfort of halls, or heading out into the city for a taste of the nightlife, glow products are going to be there with you to bring that little extra something. Party hard and prepare yourself for your university adventure.